Great service, speedy delivery and easily fitted. Previous battery also Varta and used it without problem for years. Looking for the same with this one. Fast delivery, perfect service, good product ?? Bought this at the same time as a battery for my bike. Delivery cost was very good considering I had two batteries. With both arriving together the next day in a well packaged box. Used both Varta and Tanya before and I have no complaints. This is the second replacement Varta battery installed in this car- the original and first replacement having lasted for 16 years - so the quality is proven! This one will probably outlive the car. This is not a common size,so a little more expensive than the few cheaper alternatives but worth the extra for the confidence in build quality and guarantee. From my experience with them in this and other vehicles I am happy to recommend Varta batteries . Tayna service is excellent,too - the battery delivered in 24 hours and well packaged - installed and ready to go in quick order! 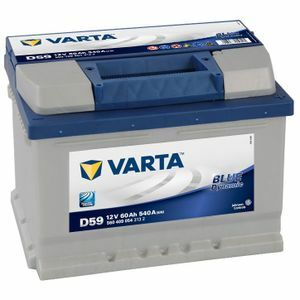 I bought the Varta battery as a direct replacement for the Varta battery I have had in my car for 7 years. The battery arrived by courier within 24 hours of ordering - once the secure packaging had been removed and the red travelling plugs had been removed it was a simple direct swap to install the battery - ignition key in - great start - no hassle. Hopefully it will stay 5 stars and yes, my car starts instantly and as it used to. Had Varta before and a different replacement fitted by a mechanic was a less powerful, smaller battery, failing me after about 19 months. This Varta was delivered the day following my order, well packed with clear instructions to open plastic wrapping at once. My second time of ordering from TAYNA and I am delighted. Great price and great service from Tayna. The battery arrived next day and was very carefully packaged, with clear instructions for how to remove the various transit vents. The Varta battery is a newer version of the one that was already in the car when I bought it (4 1/2 years ago) and have been very happy with its performance. If this new one performs as well I'll be very pleased. fit my focus 2008 MK2 automatic perfectly. Best price I could find online, very fast delivery. It's to early to say anything about battery itself, it just works. But definitely can recommend Tayna Batteries to everyone. 1st class service. Information regarding the battery I required was easy to find on the web site. The pricing,delivery cost was very reasonable and delivery was within 24 hours. Will be using again when necessary. All fit fine. Thanks you.